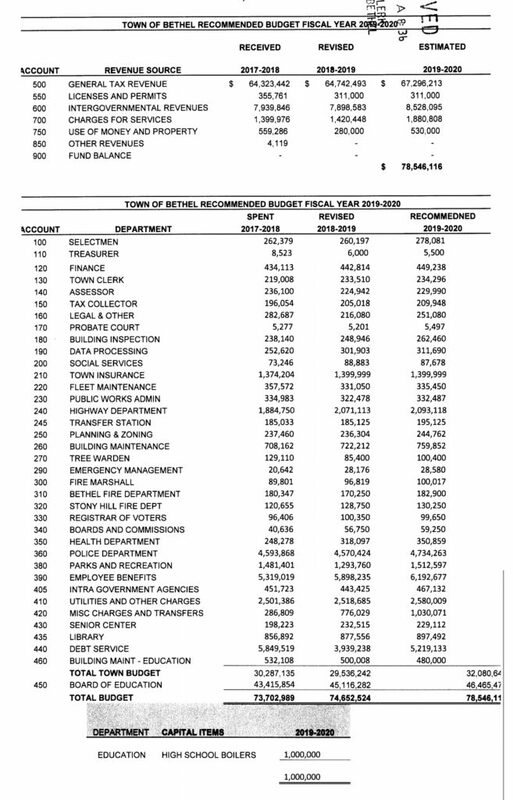 At a meeting of the Board of Finance, which concluded on March 6, 2019, the following estimates of expenditures and revenues were recommended for the fiscal year commencing July 1, 2019 and ending June 30, 2020. A public hearing on the recommended budget will be held on Tuesday, March 19, 2019 at 7: 00 p. m. at the Bethel Middle School Auditorium, 600 Whittlesey Drive, Bethel, Connecticut. All persons entitled to vote at the Annual Town Budget Meeting are invited to make written and oral comments concerning the recommended budget. Copies of the recommended budget are on file in the Town Clerk’ s Office, Clifford J. Hurgin Municipal Center and are available for inspection.